1 Why Do You Need Dive Boots or Fin Socks? 4 How to Care For Your Booties and Socks? Diving can abuse your feet. That last thing you want to be worried about is a hot spot on your heel at the beginning of a dive. Not only is it uncomfortable during your dive, but the recovery from the painful blister will dampen your entire week. That’s why you need the diving boots if you go scuba diving or fin socks if you go freediving and spearfishing. Dive boots protect your feet from sharp objects in and out of the water, fin rub, and water temperature. I know that it’s hard to find the right gear without trying it on, but if you’ve ever bought shoes online, you’ll be able to pick the right dive boots and socks to protect your feet. Let’s dive in to why you need a quality pair of boots and socks! Why Do You Need Dive Boots or Fin Socks? The main role of dive boots is to protect your feet. This protection can range from dry land protection to underwater protection. While you’re walking to the diving spot, you can step on sharp objects or rocks that will injure your feet. That was the most painful walk ever! If I had my dive boots, it wouldn’t have been a problem since there is way more padding in the sole of a dive boot than fins socks. Lesson learned. Sharp objects can also hurt you underwater. The worst part is that you can’t see what you’re about to step on due to the water blocking your visibility. Water also brings about other issues like rubbing and cold temperature. Think of dive boots and socks like an extra layer skin to protect yourself from blisters and losing too much heat. Remember, water pulls heat away from your skin more efficiently than air. Left: This scuba diver has scuba fins and dive boots. Right: This scuba diver has foot pocket fins but forgot their dive socks…they are in for a world of hurt! Neoprene is a popular material in making protective clothing for aquatic activities. Boots made from this material are known for keeping your feet warm in cold waters. If you’re diving in warmer water, opt for a thinner neoprene material. It’s usually always advised that you wear some kind of foot covering even when diving in warm water. They’re great for protection against sharp objects that you might step on. They feel like you’re wearing a regular boot. The sole is made of rubber and come in a variety of thicknesses. Since a scuba fin has a large foot pocket, this allows for the extra boot material to have room in the fin. Zippers are a great addition to any type of boots. The system makes putting on and taking off the boot very easy. When you have all your gear on and you somehow get a pebble inside your boot, the last thing you want to do is struggle getting your boot off to get it out. Zippers make this task easy. If you get a zipper, make sure you take extra care of your boots. If you don’t rinse them off after your dive, they can deteriorate and even break. This usually happens to zippers that are made from metal which can rust and break off over time. Neoprene socks are used by freedivers what wear full foot fins. They offer a fair amount of thermal protection to the feet. These socks are pretty flexible and will not affect your feet movement while underwater. They can also be put on the inside of your diving suit to keep you extra warm. They do not offer that great protection outside of preventing fin rubbing on your skin. Their sole is fairly thin and it can easily rip when stepping on sharp objects or rocks. It is good to wear a pair of sandals when traveling to the diving spot. How to Care For Your Booties and Socks? Dry diving socks can be hard to put on. Neoprene, especially the open cell type, can have a lot of friction against your skin making it hard to slide on without lubricant. If you try to force them on, you can damage the socks so it’s best practice to at least get them wet or add a little soap and water to the sock before putting it on your feet. The dive boots are easy to care for. After a diving session, all you have to do is rinse them in water and let them dry. Be careful not to use any type of cleaning substance or hard soaps because they can damage the materials. If you want to do so, use substances that will not affect the quality of the rubber or the glue that keeps it in place. Try your best to keep them out of direct sunlight for prolonged periods of time. After they dry out, keep them in a cool dark place until your next dive. Nothing is more liberating than freediving with comfortable fins and having freediving socks that protect your feet. What size are your fins? Choosing the right boots will depend on your fin size. Generally, dive boots are made to work with all types of scuba fins. The size of your feet will play an important role here. Match the size of your boot to the size of your fin pocket. 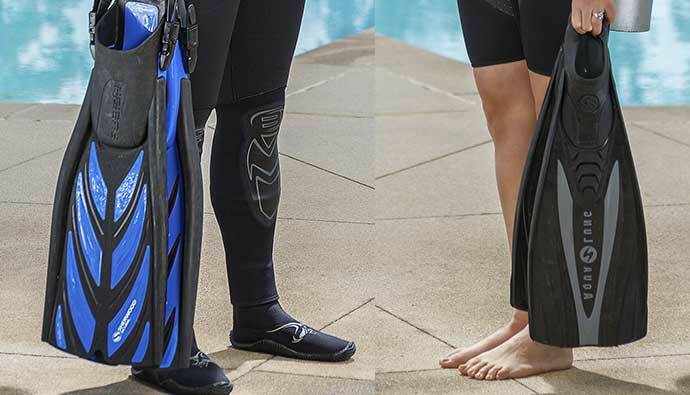 If you are using open heel fins with a spring heel or adjustable heel, as long as your foot pocket is comfortable, your dive boot will fit well. Scuba dive boots should fit like a shoe, somewhat cozy yet not very tight and not very free. Your toes ought not to be nestled into the end of the boot as this will cause cramping in your leg or foot. Having boots that are larger than your feet will cause them to slip off very easily, and you don’t want to lose them in the water. On the opposite side, buy boots that are too small will be uncomfortable and will cut your dive short. Boots that are the wrong size will alter your fin movement in the water making your energy expenditure less efficient. Don’t burn out because you’re wearing the wrong gear. How thick do you want the neoprene? The thickness of the neoprene is related to thermal protection. Having thicker boots will ensure a better insulation. As extremities tend to get colder faster than other parts of the body, having the right boots is essential. You don’t want to lose heat fast while in the water as hypothermia can be dangerous. Usually, thinner boots are used for scuba diving, freediving and spearfishing in water between 16°C and 24°C. Thicker boots are made for scuba diving in water between 10° C and 18°C. The colder the water, the thicker the boots. How thick do you want the sole? Having a thick sole will give you more protection from sharp objects. But a thicker sole will mean that you will not be able to move your feet freely in the water. The opposite is true for a thinner sole, you’ll have more feel and flexibility in your fin but less protection on land. Soles can also help prevent you from slipping while you’re walking to your dive spot. As with every other piece of clothing, boots come in different colors. Mostly this is up for personal preference. Having boots in a lighter and unusual color like red, pink, yellow, can help other divers see you in the water. It’ll also help you know which pair is yours if your gear gets mixed up with another diver. Zipper or no zipper for the booties? Zippers are a great way to have your boots mounted on your feet. Boots that have zippers will be easier to take on and off when you’re gearing up or down. In some cases, the zipper can get rusted and break if it’s not made from materials that are resistant to ocean water. Boots without zippers will feel more like socks and will be lighter as there is less material on the boot. Try both styles on and see which feel best for you. Do you want a sole on the socks? Having a sole on the socks serves the same purpose as having one on your boots. The sole provides protection while walking on land or in water. Stepping over a sharp object or rock is not that great. Your sole will depend on how tight your freediving fins are. If you want the best fit it’s better to opt for a regular freediving fin sock and wear sandals to your dive spot for protection. Built in sole to provide extra comfort. 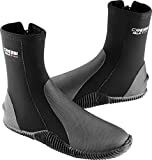 The Cressi Neoprene Anti-Slip Boots are the perfect type of boots to have in your diving equipment. The Isla boot is perfect for any diver or snorkeler headed to cooler waters. With a watertight seal zipper and built-in fin strap holder for open heel fins, the Isla is made for an easy and comfortable fit for everyone. They are made from neoprene, making them resistant and that means that they also provide good thermal protection for the feet. With any zipper style boot they can let it a bit more water than the non-zipper style. Some have said that they are a bit hard to put on until they are broken in. Those boots are great for scuba diving. They are made from quality materials that are resistant to wear and tear. The sole is quite solid and it makes walking on sharp objects not that difficult. The build quality is amazing, the boots don’t fall apart. They are excellent at keeping the feet warm. The Mares Equator 2mm Dive Boots combine both strong build materials with the lightness of a feather. The boots are solid and excellent to take on any diving trip. The sole is strong enough to resist cuts from sharp objects or rocks. The material also helps keep your feet warm in cold water. These run large so make sure you pick a size one to two sizes smaller than what you regularly wear to get a snug fit. Some have also said they are hard to walk in until they are broken in. These shoes are feather light, strong, the soles are ample and provide traction to avoid slippage. The heels are rubberized, which keep the straps in place. Easy to wash and dry (you can easily turn them inside out). While walking on fine sand, some came in, but very few. The Pro HD boot is perfect for any diver headed to cooler waters. With an oblique seal zipper and rigid, high-grip sole for open heel fins, the Seac Pro HD is made for an easy and comfortable fit for everyone. 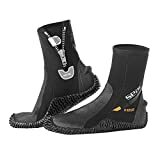 Made from 5mm neoprene, these semi-rigid boots feature a high-traction sole that grips tightly to the surface and keeps you stable, even wearing all your SCUBA gear. Soft polyurethane instep with a strap-stop notch on the heel and a lining made from standard nylon. These boots tend to run a bit large. Make sure you keep that in consideration when you are picking your size. If they are too big, add a 1mm neoprene sock inside the boot. The boots feel very comfortable when wearing. They are resistant to cuts and they don’t sacrifice comfort for strong protection. They do not slip from the foot and also, they are good for keeping the feet warm while in the water. Double-sided Bonded Nylon. Smooth on the inside for comfort, ease of entry and exit from the sock. Extra durable outer material for wear. Flexible slip-resistant tread on sole. Some have said that these socks don’t dry quickly, but this could have been caused by improper drying technique. Keep your socks in a warm place until they are dry. They provide great protection against sea urchins and other irritations that can be found while walking in the water. Also, they are great at keeping the feet warm. The boots feel very comfortable while walking in them, both in land and in water. Dive boots come in different shapes and sizes, just like regular land boots. If you go into a store, you’ll see that dive boots are made from different materials. Some are lightweight neoprene material with not much of a sole and some are rugged and thick. You’re going to want to pick the boot based on your diving needs. 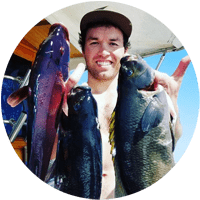 Later in this article, we’ll cover the different scenarios to help you pick the right boot, such as, knowing which is best for boat diving, easy beach diving, or what you’ll need to traverse jagged rock crossings. Freediving socks feel more like a regular sock than a boot. They are your protection between the foot pocket of your freediving fins and your delicate foot. When looking into buying dive boots you need to have in mind a couple of aspects. Durability. You want boots that can keep your feet away from injuries that can occur from cuts. Cutting yourself while stepping on sharp objects or rocks is not uncommon in the diving world. A good pair of boots will make sure that won’t happen. Comfort. The best diving boots provide good protection while not sacrificing comfort. 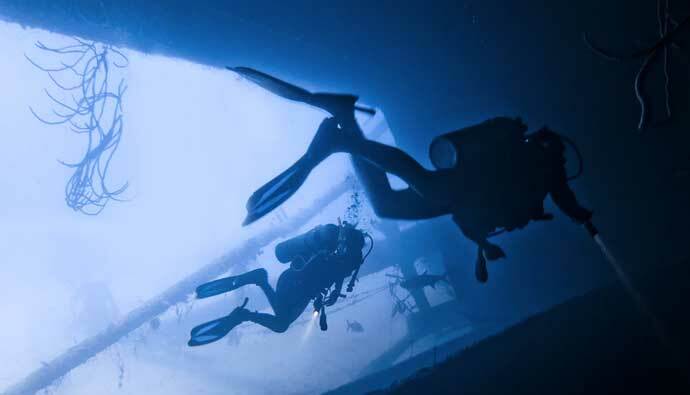 Comfort is subjective, but I believe the boot should feel good for the entire duration of your dive, from the time you put them on to when you take them off. This means how tight they are and how warm they keep your feet. While you dive in cold waters, your extremities will tend to get cold very fast. Dive boots are made from special materials that will help keep your feet warm. This happens because water that gets trapped inside the boots and warms to your body temperature giving you a layer of warm from the rest of the ocean. No matter what type of diving you’re into, I’ve broken down the options I’d recommend my friends if they were starting out diving or freediving or just needed replacements. Let me know which boots or socks you ended up getting in the comments below!